Statistical, Economic and Social Research and Training Centre for Islamic Countries (SESRIC) organised a training course on “Quality Improvement: Seed Quality and Preparation” at the Central Cotton Research Institute, Multan, Pakistan, under OIC Cotton Training Programme (OIC-CTP) on 28-30 August 2013. The Course was provided by Dr. Feride Oncan Sümer, Researcher at Cotton Research Station, Department of Fiber and Seed Technology, Nazilli, Turkey with the participation of researchers and trainers of the Central Cotton Research Institute of Pakistan. Within the context of the training programme, Pakistani researchers also received in-the-field practical training. Statistical, Economic and Social Research and Training Centre for Islamic Countries (SESRIC) organised a training course on “Plant Protection: Diseases” at the Cotton Research Institute, Ayub Agricultural Research Institute, Faisalabad, Pakistan, on 9-11 July 2013. 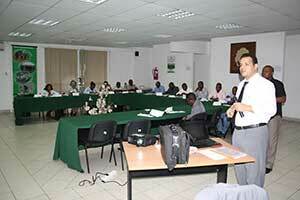 The Course was provided by Dr Kamel Abd-Elsalam, a Molecular Plant Pathologist from the Plant Pathology Research Institute, Agricultural Research Centre, Egypt and were attended by 30 agricultural protectionists and scientists dealing with cotton production at the Ayub Agricultural Research Institute. Within the context of the programme, Pakistani scientists also received in-the-field practical training. Statistical, Economic and Social Research and Training Centre for Islamic Countries (SESRIC) organised training on “Agronomy: Soil Tillage” at the Cotton Development Organisation (CDO) in Kampala, Uganda, on 15-17 January 2013. The course was provided by Prof Sheikh El Din Abdel Gadir El-Awad, an expert from Agricultural Research Corporation (ARC) in Sudan, and was attended by 18 scientists dealing with cotton production of the CDO of Uganda. Statistical, Economic and Social Research and Training Centre for Islamic Countries (SESRIC) organised training on “Agronomy: Crop Rotation and Management” within the framework of OIC Cotton Training Programme (OIC-CTP) at the Mozambique Institute for Cotton in Maputo, Mozambique, on 14-18 January 2013. The course was provided by Dr Said Abd El-Tawab Farag Hamoda, an expert from Agricultural Research Centre in Egypt, and was attended by agronomists, researchers and technicians from public and private sector.